1942, in German-occupied Paris. Younes, a young unemployed Algerian, earns his living as a black marketeer. Arrested by the French police but given a chance to avoid jail, Younes agrees to spy on the Paris Mosque. The police suspects the Mosque authorities, among which its rector Ben Ghabrit, of aiding Muslim Resistance agents, as well as helping North African Jews, by giving them false certificates. At the Mosque, Younes meets the Algerian singer Salim Halali, and is moved by Salim's beautiful voice and strong personality. A deep friendship develops, and soon after Younes discovers that Salim is Jewish. In spite of the risks it entails, Younes stops collaborating with the police, and gradually develops from being a politically ignorant immigrant worker into a fully-fledged freedom fighter. Directed by Ismaël Ferroukhi, previously responsible for the excellent 2004 Le grand voyage, Free Men stars Tahar Rahim, who made such a splash in Jacques Audiard Un prophète, and Michael Lonsdale from Of Gods and Men, and was described by Total Film as "intelligently executed, with a typically fine performance from Michael Lonsdale." 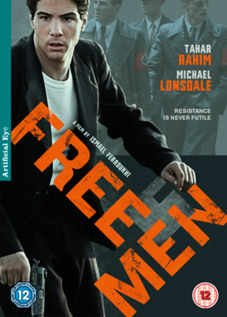 Free Men will be released on UK DVD and Blu-ray on 24th September 2012 by Artificia Eye at the RRP of £15.99 for the DVD and £19.99 for the Blu-ray. Extra feature shave yet to be confirmed.